Justice Ranjan Gogoi, who took oath as the 46th Chief Justice of India, came out with a new roster allocating cases to various benches, and decided that the Public Interest Litigation matters will be heard by him and a bench headed by Justice Madan B Lokur, who is next in seniority to him. President Ram Nath Kovind administered the oath to Justice Gogoi, 63, at a brief ceremony in Rashtrapati Bhavan’s historic Darbar Hall. 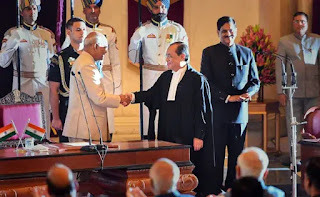 Justice Gogoi, who took the oath in English in the name of god, will have a tenure of a little over 13 months and will retire on November 17, 2019. He succeeds Justice Dipak Misra who retired Tuesday on attaining the age of 65 years. Several leaders, including Prime Minister Narendra Modi, his predecessor Manmohan Singh and former premier H D Deve Gowda were present at the ceremony. 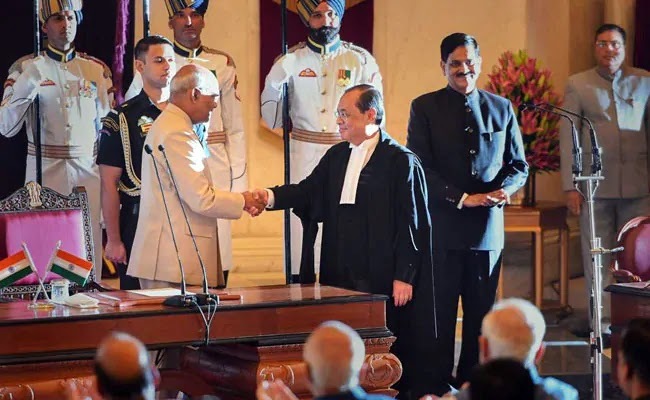 After the swearing-in, Justice Gogoi came back to the Supreme Court and presided over the bench along with Justices SK Kaul and KM Joseph in Court number 1, the CJI’s court. The new CJI began the day by telling lawyers that fresh parameters would be worked out for mentioning the matters for hearing of cases which require hearing on priority and urgent mentioning. Justice Gogoi said “no urgent mentioning of cases will be allowed” till certain parameters are fixed for it. “If somebody is going to be hanged tomorrow, then we can understand (the urgency)”, he added. The CJI decided to keep with himself the PIL and the petitions based on the letters received. Prime Minister Narendra Modi congratulated Justice Gogoi on taking over as the CJI, saying his experience and wisdom would benefit the country.